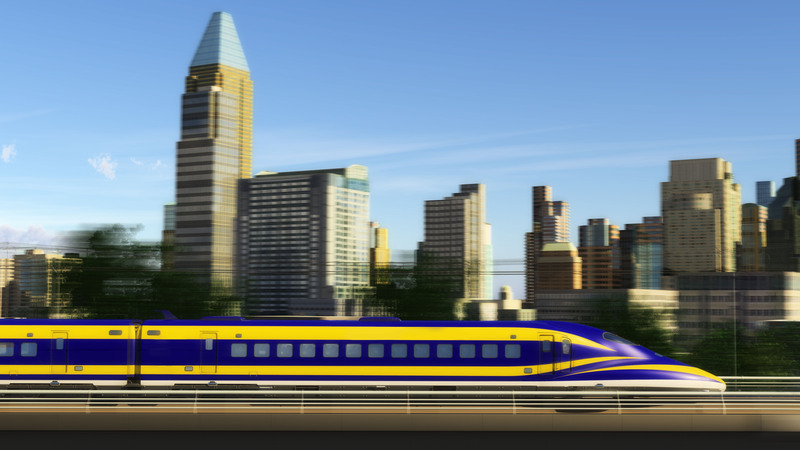 SAN FRANCISCO (CN) – An impending decision by the California Supreme Court over whether the state or federal government has jurisdiction in railway decisions could have major implications for the Golden State’s high-speed rail project. The justices heard oral argument by the North Coast Railway Authority, which argued the federal government’s decision to allow freight service to resume on a 316-mile line that runs through northern counties outweighs the state’s environmental rules under the California Environmental Protection Act. “Federal courts have universally ruled that open-ended pre-clearance processes like CEQA are preempted by the authority of federal regulators,” said Andrew Sabey, attorney for Northwest Pacific. The railroad operates the freight trains that traverse through Sonoma, Humboldt and Mendocino counties. Part of the line includes a stretch that winds through the Eel River Canyon, where environmentalists say the legacy of the old rail line is toxic – leaving behind lead, dioxin and other substances that have contaminated the watershed. Friends of the Eel River and Californians for Alternatives to Toxics initially sued in 2011, saying that an environmental impact report concentrated too narrowly on a tiny stretch of the 316-mile line and did not account for toxic substances being reintroduced to waterways such as the Eel River as a result of the repairs. The rail authority says they’re not obligated to conduct any environmental analysis related to CEQA since the Surface Transportation Board, the federal railroad regulator, already gave it the green light. But Amy Bricker, attorney for Friends of Eel River, said the issue is about California’s ability to enforce its own environmental laws. The argument appeared to gain traction with the justices, as Chief Justice Tani Cantil-Sakauye repeatedly and pointedly probed Sabey on why the state should not have the ability to weigh in on the matter. “If the state owns an environmentally troubled railroad and decides for itself it wants to comply with CEQA, you are saying they can’t?” Cantil-Sakauye asked the railroad’s attorney at one point. Sabey responded in the affirmative. Essentially, the necessity to keep intrastate rail commerce uniform through the states means the federal government can preempt state laws in certain matters, particularly in matters related to open-ended questions that could potentially delay or stop freight service. Sabey said the railway is bound to state rules that are verifiable, even environmental rules such as how much lead can be in a river. But he said CEQA is open-ended, with no deadlines or quantifiable checkboxes, and therefore preempted by federal law. No matter how the justices rule, it figures to have major implications for other rail projects currently in the works, according to Ethan Elkind, the director of climate policy for the University of California, Berkeley, center for law, energy and the environment. Elkind said he believes there is an implicit bias and that the California Supreme Court will rule in favor of upholding state laws over federal ones, although he was careful to say the ruling could go either way. If Cantil-Sakauye and the other justices rule in favor of the environmental groups, it create legal loggerheads with another case winding through the federal courts. Kings and Kern counties sued the Surface Transportation Board along with five civic groups in the Ninth Circuit in 2015, saying its decision to preempt CEQA with the construction of the Fresno-to-Bakersfield segment of the high-speed rail project is illegal. Elkind said it isn’t difficult to envision a scenario in which state courts rule for state sovereignty and federal courts rule in favor of federal preemption, meaning the U.S. Supreme Court will likely step in and decide the issue permanently.